Amazon gives SACRIFICE and THE 13TH new life; NIGHTWHERE coming soon in audiobook, limited edition hardcover and German translation! "Once the inspiration of lovers, the full moon now filled hearts with fear...."
This week, I've launched a very special e-book, and I thought that you might want to know about it sooner than later, hence this additional January notice! 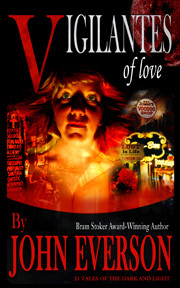 It's hard to believe, but it was 10 years ago that Twilight Tales Books in Chicago issued my 2nd collection of short fantasy and macabre stories, Vigilantes of Love. Since Twilight Tales is no longer around, to celebrate the anniversary, I've gone back and retooled the cover, added a new introduction and six more short stories that didn't end up in the original release and have never been collected in my other fiction collections - "Hair of the Dog," "Tomatoes," "Tunnel," "The Key To Her Heart," "Why Do You Stay With Him?" and my very first published story, "Learning to Build." I've been tinkering with this update on and off since last summer, so I'm excited that it's finally launched over the past couple days! 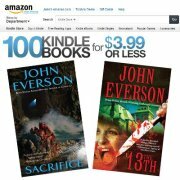 Amazon's Sale on Sacrifice, The 13th, is almost over! Can you believe it - we're already a month into 2013! I'm just happy we're a month closer to summer... not that I can complain about a January in Chicago that actually boasted a 60 degree day! I'll be back with more news for you in February. In the meantime, if you're near Chicago, I hope you'll come out to my fiction reading in Chicago on Tuesday, or my signing at the Barnes & Noble in Racine in mid-February (see the Appearances box above).